Programs created for earlier version of Microsoft Windows might not work properly on the latest version of the operating system. 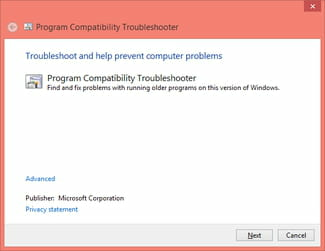 Windows 8.1 includes a Program Compatibility Troubleshooter feature to fix issues encountered old programs. On the StartScreen, click on the Search icon > Settings. 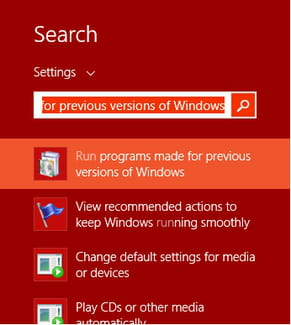 Search for the following "Run programs made for previous versions of Windows". 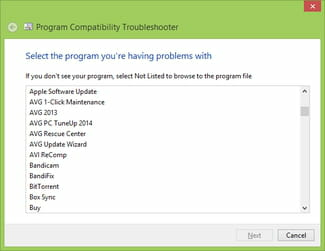 Select the program (causing issues) from the list (click on Non-Listed to search for the program manually). Click on Next. 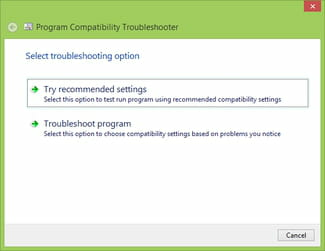 The utility will check for issues with the selected programs. Published by jak58. Latest update on December 17, 2014 at 09:07 AM by jak58. 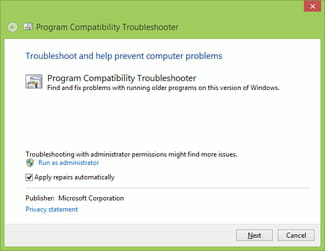 This document, titled "Windows 8.1 - How to use the Program Compatibility Troubleshooter," is available under the Creative Commons license. Any copy, reuse, or modification of the content should be sufficiently credited to CCM (https://ccm.net/).